I don’t mean to be biased, but all other pumpkin pies have NOTHING on this one. 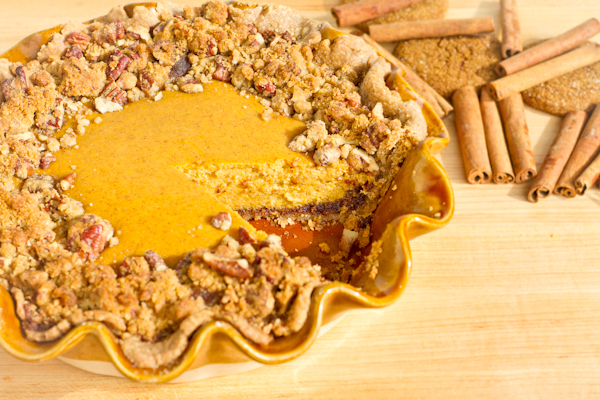 Every bite of this amazing pumpkin pie has the smooth and rich pumpkin, spicy gingersnaps, buttery pecans, and of course the warm brown sugar touch. I’m telling you right now that if you make this upgraded pumpkin pie for your guests at Thanksgiving, you will have everyone wanting the recipe. You’ll be the talk of the night, and everyone will be so grateful to have you, the master pastry chef, in their family. In a large bowl (with an electric hand mixer) or in your stand mixer, combine the flour, salt and butter. Next add in 1 tablespoon of the ice cold water into the mixer at a time, until the dough will form a ball when pressed in. Form the dough into a disk shape, wrap in plastic wrap and place in the refrigerator for about 30 minutes until it’s cold. Roll out the pie crust onto a floured surface. Carefully transfer it to your pie plate, crimp, and tuck under the excess dough. Now, in a food processor or blender combine the pecans and gingersnaps and chop them until they are finely chopped. Add in the powdered sugar, combine. Drizzle the butter in and combine. Push gingersnap mixture in the bottom and halfway up the sides of the crust. Beat eggs in your stand mixer or with your hand mixer. Pour the pie filling into the crust and cover with a pie crust shell or foil to protect the crust. Remove and sprinkle the Pecan Streusel (recipe below) around the edges. Let cool for about an hour. Combine all ingredients and sprinkle round the outside edges of the pie. Wow, that is a beauty, and it would definitely be a treat on any Thanksgiving table. Thank you so much! I hope you and Mr. P have a lovely Thanksgiving! Oh WOW – talk about the ultimate pumpkin pie! Superb! What a pretty pumpkin pie! What a fabulous way to dress up a pumpkin pie! I love a streusel top. Please make one for us all for Thanksgiving! I am thankful to have a creative chef just a click away. If only you could FTP a delectable. If only. That would be amazing. 🙂 Love you Dad! Oh, gingersnaps in the crust – how yummy!! Thanks for sharing. This pie looks delicious. 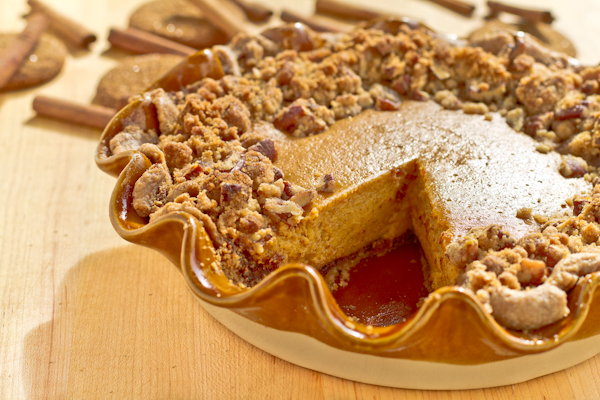 I love the idea of a gingersnap crust for that extra zing. It’s beautiful as well and I love the scalloped edge pie plate. Very nice post. That’s great! That is a goooood pie. It makes me so happy that you tried it…and especially happy that you loved it! 😀 Thanks Lori! 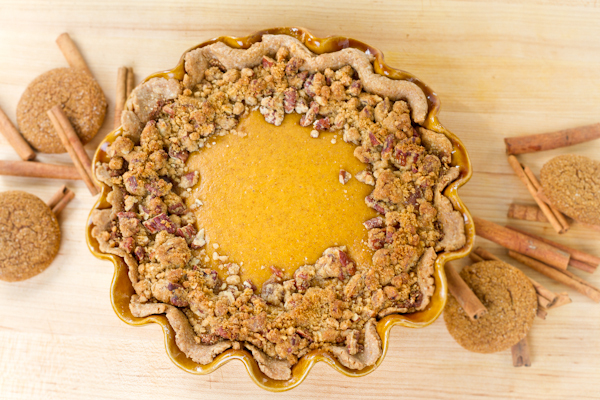 I love this gingersnap twist on pumpkin pie! I could see this making an appearance at Thanksgiving… or even sooner. You already know I am a big fan of your baking but this gingersnap pie is just about the best pie I have ever tasted and I have tasted a lot of really good pies in my time. Great job and thanks for all you do for the RE group. Pecans are $20/lb here and can’t bring myself to buy them. Would walnuts be almost as good? I don’t eat nuts (other than peanuts) so I don’t really know. I just read that they’re an okay substitute, but do you think they fit with pumpkin? I’m making gingersnap tomorrow so that I’ll be able to make this. I’m so excited! That’s outrageous. I guess there aren’t any pecan trees in Germany, eh? 😉 But yeah, I bet walnuts would work fine. 🙂 I hope you enjoy it! Oh, no…sad. Dumb apple pie. 😉 I know the feeling with the smoke thing. When I made the mini gingersnap pies I had the same thing happen and it took me a couple times of baking to remember that I NEEDED to clean the oven. I finally did it and it’s all normal again. 🙂 I had a great Thanksgiving…I hope you and your husband were able to celebrate!